Wegener's ideas were rejected by his contemporaries and he died in Greenland without ever knowing how Continental Drift occurred or having his ideas accepted. So how did we get from that to what we believe today? What did he discover? How and why did he discover it? What did oceanographers discover in the Atlantic in 1953 and what was it called? How high are the mountains in the middle of the Atlantic? What did Hess discover about the rocks in the Mid-Atlantic Ridge? What were Hess's conclusions about what was happening at the Mid-Atlantic Ridge? What did he call it? Why is the earth not getting bigger if new crust is being created? ​Start watching the video on the left at 6 minutes 30 seconds. By the 1960s what theory had both Hess' and Wegener's ideas been combined to create? What are plates? How fast do they move? If they move so slowly, why is this important? What is going to happen to the continents over the next millions of years? What are some of the consequences of this plate movement - give some examples. Plan carefully - you will need room for your annotations. Title (clear, bold, says exactly what your diagram will show). Key (what do the colours mean if you use them? Colour only if needed and chosen carefully (not just for decoration). Annotation can be inside or outside the frame but be consistent. Arrows drawn with a ruler. Keep it simple. It will be easier to draw simple circles than to try to create a 3D drawing. What should the diagram include? 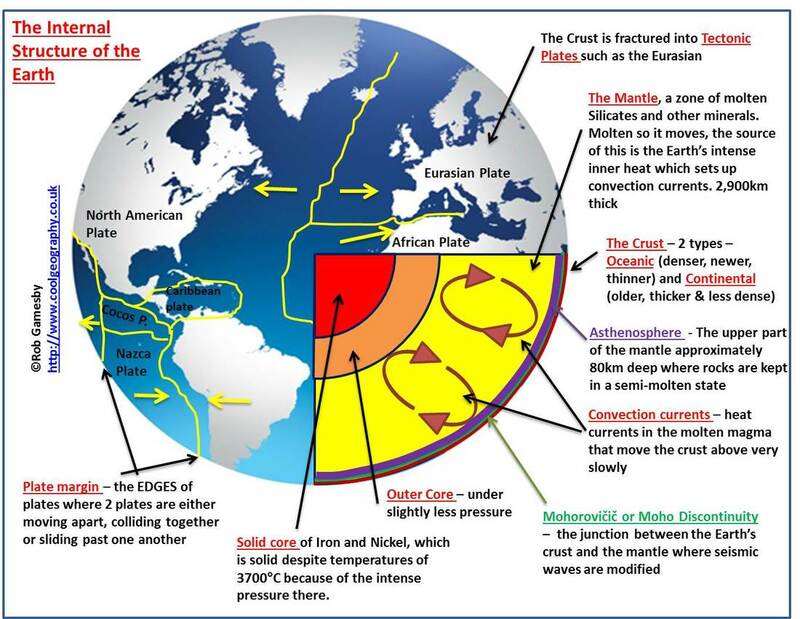 Explanation of two types of crust (continental and oceanic) and their differences. 3. How do we know about the layers? So, how do we know about the earth's structure? This video should help you to understand. Why is the type of crust (oceanic or continental) important? 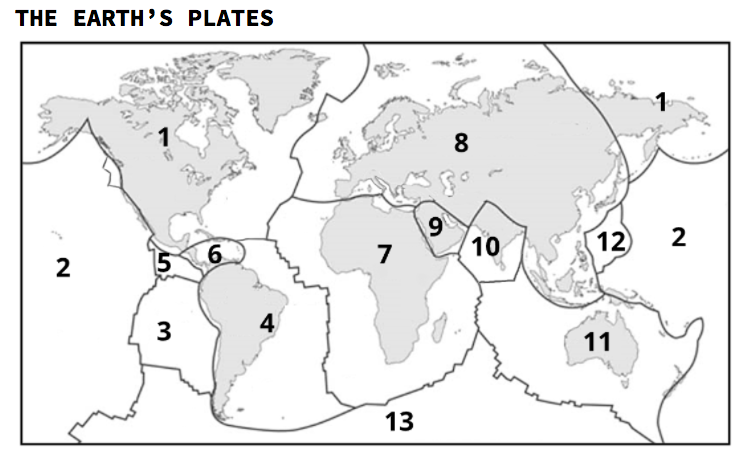 CLICK ON THE IMAGE BELOW TO OPEN A BLANK MAP AND KEY OF THE EARTH'S PLATES. 5. 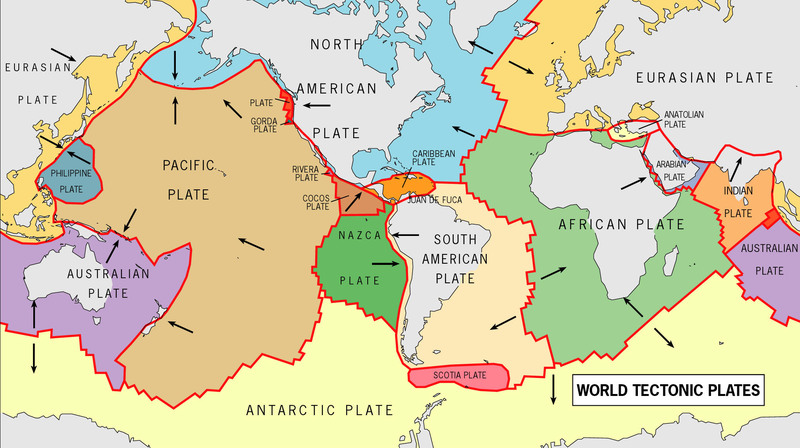 Plate tectonics: Why do the plates move?